Nights of Accommodation at a local hotel, includes a cooked breakfast. Designed for agency cleaning teams who need expert training in the best techniques to clean tile and stone and grout including limescale removal. This course is 95% hands-on and held at our 120m2 purpose built training workshop in Carnforth, Lancashire which has been fitted with a huge variety of Tile and Stone materials. 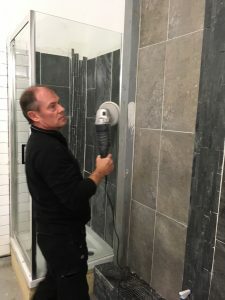 You will learn the different techniques, products and skills needed to clean, restore and seal the most common types of Tile and Stone in the UK and most importantly build confidence. Advanced Cleaning Methods of Floor and Wall Tile. Correct Sealing Methods including Water Testing. Burnishing Floor and Wall tile including Spray Burnishing. The contents of the course can be varied to suit your needs and costs £395 (+VAT) which includes Bed & Breakfast for one night in a local hotel.